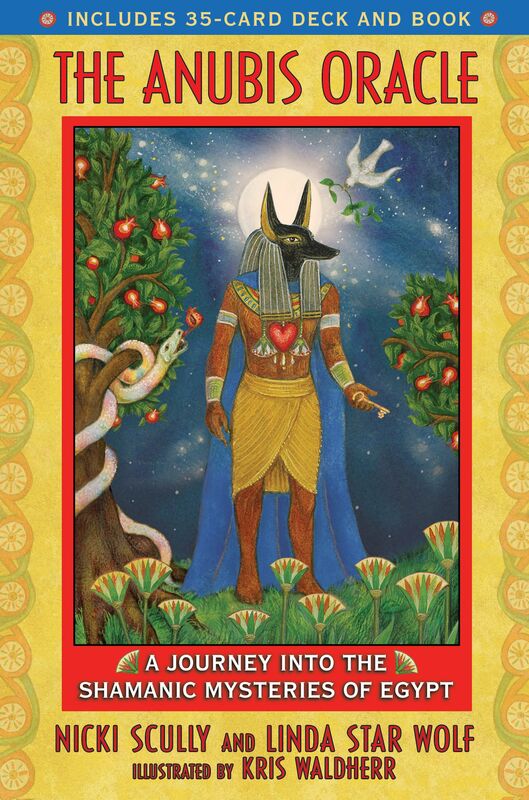 The Anubis Oracle is a shamanic guide to inner Egypt, a place of mystery, ancestral wisdom, and abiding love that resides within each of us. It is a place where the neteru--the archetypal deities and elemental spirits from the Egyptian pantheon--lead us on our journey of transformation, a journey designed to open our hearts and teach us the inner workings of the soul. The full-color deck contains a Key Card, a card for each of the 22 deities and 4 elements, and 8 composite cards that portray several deities together. These composites represent 8 major portals of initiation and complex archetypal relationships. The accompanying book provides detailed interpretations for each card and instructions for 8 divinatory spreads that include entering into the mystery, achieving higher love and wisdom, and identifying our sacred purpose. By divining with the neteru, the shaman within awakens. This allows the neteru to reveal the answers we seek in our personal lives and in our interactions with the world by connecting us with the wisdom, guidance, and shamanic mysteries of Egypt that live within us. NEPHTHYS IS THE hidden or veiled one who serves as a medium between worlds. She comes to us in dreams, flashes of intuition, and visions. Along with Isis and Nekhbet-Mother-Mut, Nephthys is an aspect of the Triple Goddess. She relies upon spirit to direct her in all things and she holds the mystery teachings of life, death, and rebirth deep within her essence. The mother of Anubis, Nephthys is also the true Virgin, or the woman unto herself, in her manifestation as the High Priestess. In our shamanic visionary experience, she inspires the seeker as she whispers her secrets into the wind and dances exotically under the starry sky, with magnificent serpents winding around her beautiful bronze arms. When Nephthys appears, she is working with your third eye and your sense of intuition, which will guide you further into the mysteries and to that which is hidden in your subconscious mind. She helps you to see in the dark. If you’ve pulled this card, be especially attentive or watchful for synchronicities. (What you may normally think of as a coincidence is actually the universe trying to gain your attention.) Pay attention to those sudden “hits” of inner knowing and guidance, and watch for those outer events or experiences that form synchronistic parallels to the inner messages you’re receiving. When you give yourself to the magic of Nephthys, she doesn’t stop at opening your mind’s eye; she also opens your heart. Allow your entire being to thrive as you begin to see things in a new way. THE SACRED CRESTED Ibis, known to ancient Egyptians as the akh bird, is associated with the element of air and with Thoth as he relates to the cosmic mysteries. The Crested Ibis is in essence the phoenix rising from the fire. It speaks of rebirth and the clear thinking that gives you the understanding of your journey. The symbolism refers to the ability to conceive of a resulting creation in advance of its actualization. It refers to both the preconceived idea and the goal, all of which are contained in the mind. The domain of the element air includes communication, language, and articulation. It is through air that we speak words of power, and it is by making sound and music--toning, chanting, singing, speaking, and breathing--that we express the element air. Through our connection with air we find sound within ourselves and communicate directly from the throat. Aesthetics, including beauty and pleasure also exist in the domain of air. When this card comes up in your reading, it is time to look at how you express yourself, especially in your communications with others. You have a valuable ally in the sacred crested ibis. When you meditate on this card, you will feel your consciousness rise as you are uplifted to a higher perspective, from which you can see whatever situation or question you have brought in a new way. Use this perspective for clarity and thoughtfulness in your thinking and speaking. Breathe consciously the element air. Use the heart breath described earlier, or simply be aware as you fill with the breath of life. The element air will assist you to experience and express wisdom with joy and with a light heart so you can appreciate the humor and playfulness available all around you. THE MAGIC OF Hathor’s unconditional love prepares you to meet your shadow. Set, as the Holy Trickster, shows you your shadow and clears the pathway for you to receive Wadjet’s great awakening of life-force energy. It’s possible to meet your shadow fearlessly when you understand it’s not about what’s wrong with you. As you look honestly at yourself under the care of this triad, a new infusion of energy comes in to move you to the next level of consciousness. Kris Waldherr is an illustrator, author, and creator of several oracle sets, including The Goddess Tarot, The Lover’s Path Tarot, and The Goddess Inspiration Oracle. She lives in New York.
" . . . anyone with an interest in the Gods and Goddesses of Egypt will probably feel an extra special draw . . .
"What's really fun and interesting about this deck is that it is based on the mysteries and knowledge of Egypt, so if one is not familiar with these, this is a chance to learn something new." "As a big fan of Nicki Scully's books on journeying with animal spirits, I eargerly embraced this deck, created with her clairvoyant colleague in shamanism, Linda Star Wolf, and artist Kris Walkherr. Its are has all the soft, open color and popular appeal we've come to expect from Walkherr, known especially for her Goddess Tarot. This is a lovable oracle." "A lush journey into the mysteries of ancient Egypt, this deck takes the reader on a quest of self-knowledge. The advanced user will enjoy the rich imagery and the depth of care and understanding utilized to create each fully realized aspect of the deck, while the beginner can use the images to advance her own understanding of greater mysteries."